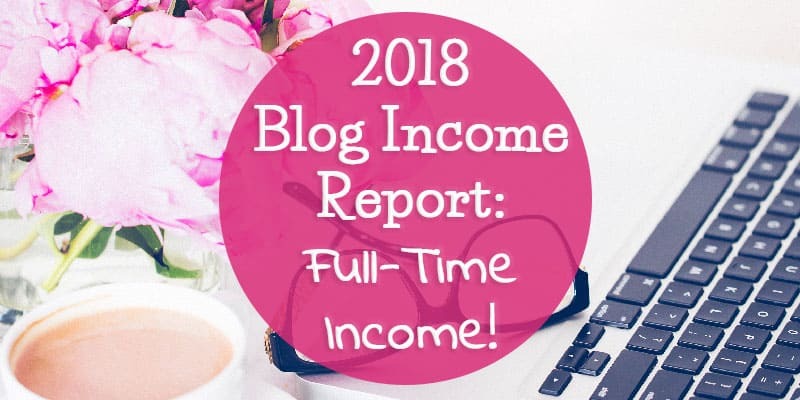 2018 Blog Income Report: Full-Time Income! My blog changed a lot for our family in 2018. I made more blogging last year than I ever did working full time in an office, which is crazy-cool. Plus, because of my income, we were able to pay off $19,000 in debt in one year (everything but our mortgage)! My blog income was honestly life-changing for our family. As someone who writes about personal finance, it feels crazy to ignore the significant impact my blog has had on our finances. If you’ve been curious about blogging, I want to encourage you to give it a go! I love what I do! It took me years of floundering to figure out how to combine my interests, skills, and knowledge and maybe blogging could be that for you, too. I want to share that it is possible to make money online from home — if you work hard at it. Seriously, it doesn’t come easy. But if you want it, it is possible. 2018 was my third year blogging and I’m so proud of my progress! 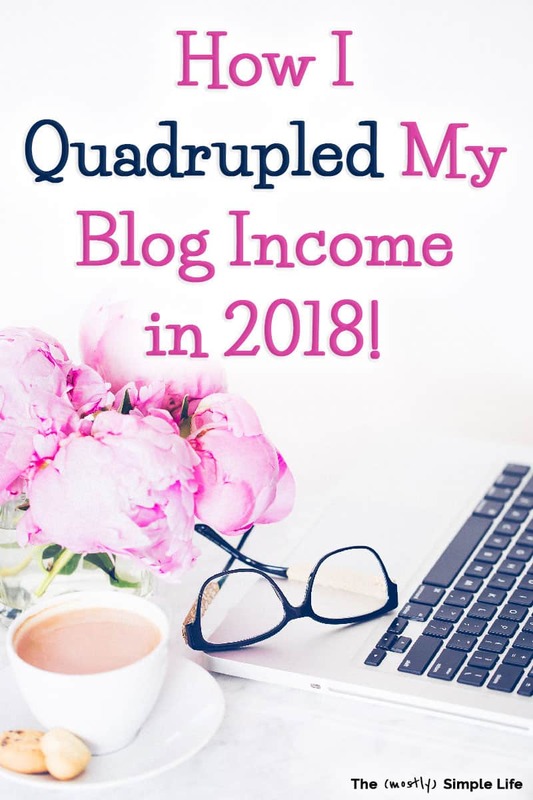 I almost quadrupled my income from 2017! The main way that I did this was by treating my blog like a business. I’m not joking when I say that making money blogging doesn’t come easy. It doesn’t happen on accident. I took a few important steps to treating my blog like a business in 2018 and it paid off in a big way. If you want to learn what I did, enter your info in the form below and I’ll send you my free guide about how to make money blogging by treating your blog like a business. It’s got a lot of great info that most people don’t talk about much and I’m so excited to share it with you! 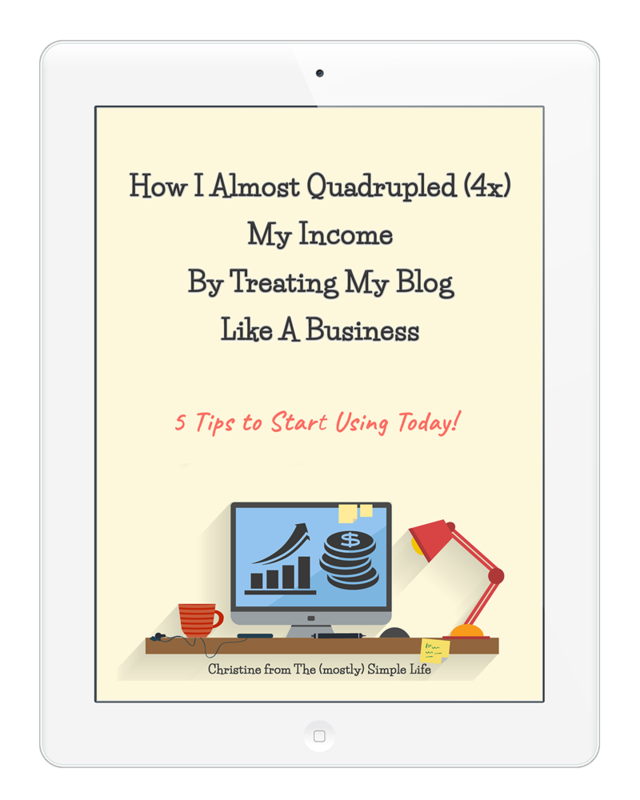 Learn How I Almost Quadrupled My Income By Treating My Blog Like a Business! Start Applying These 5 Tips Today! I use (and love!) Mediavine as my ad network. I averaged 108,000 pageviews per month in 2018, so ad money makes up the biggest chunk of my income. Most of my pageviews come from Pinterest. I use Tailwind to schedule my pins and follow the strategy laid out in the Pinning Perfect course. One of the creators of Pinning Perfect has contacts within Pinterest, so she makes great recommendations based on what Pinterest actually says to do, which is so nice because there is a lot of bad pinning advice out there. My affiliate incomes adds up in little bits from so many different sources! Plus, there are many individual affiliate programs for different products and courses. My earnings for the year through each of these ranges from $6 to $1577, so it’s a lot of smaller amounts that add up over time. I’ve gone through quite a few different affiliate trainings, and none of them has taught me as much as my very first one: Making Sense of Affiliate Marketing. I went from earning a few dollars here and there to earning $700-900 per month consistently in my first year of blogging because of that course! I continued to sell Let’s Make Meal Planning Simple (my step-by-step meal planning guide) in 2018. Plus, I created an ebook called Clutter-Free(dom) to help people declutter their homes and keep the clutter from coming back. Once you get the hang of it, it’s a lot of fun and very exciting. Plus, you get to keep most of the money you make from your products, unlike with affiliate marketing where you only get a small percentage. Sidenote: You can read my full review of Elite Blog Academy here. I did my first sponsored post in 2018. It was a big learning experience. BUT. We haven’t talked expenses or taxes yet! Big number, right? Starting a blog is super cheap, but as it grows, so do some of your expenses. As I got things ready for our tax guy, I looked over my expenses to try and decide if I spent frivolously anywhere and I’m actually quite happy with my expenses. I could have cut a few things, but they were tiny things. The big expensive stuff was worth it. I won’t break down every dollar, but I will show you where the bulk of my expenses came from. ConvertKit: $1,414. My email list is getting expensive! The larger your list, the more you pay. If you’re just starting out, don’t get freaked out by this number. It will be much lower for you. I’m thrilled my email list is growing so much and I love connecting with my readers in my weekly newsletter! BigScoots: $418. My hosting company! I had a lot of problems with Bluehost and have not had a single issue since switching to BigScoots. They have very inexpensive plans if you’re just starting out by the way. Mine is more expensive because of the traffic I get. RecurPost: $300. This is the software I use to schedule my Facebook posts. It allows me to build up a library of posts that it cycles through which is a big time saver. LeadPages: $300. I switched to LeadPages this year after having a lot of issues with a cheaper landing page software. I cringed at the price, but haven’t had any problems since switching so it was worth it. Education: $231. I bought a few inexpensive courses in 2018. I purposefully kept this number super low so that I could focus on other things. As of January of 2019, I’ve actually purchased a huge $1,500 course, so my education costs fluctuate a lot year to year! Haute Stock Photos: $198. This is a stock photo service I use. Photoshop: $127. There are free or cheaper photo editing options, but I’m so used to Photoshop that I struggle anytime I try to use something else. Tailwind: $208. Tailwind is what I use to schedule pins for Pinterest. I started using it because Pinning Perfect recommended it and taught me how to use it. Now that I understand how it works, It only takes me a few hours per month to manage. Gumroad: $120. Gumroad handles the payments and delivery of my digital products. The rest of my expenses are littler things like my PO Box, the annual fee for my LLC, paying for products I want to test before recommending them, and a few office supplies here and there. And don’t forget about taxes! I pay estimated taxes each quarter. This takes a big chunk out of my earnings. I also don’t get health insurance or retirement benefits since I’m self employed. Thankfully, my husband’s job provides health insurance. I have a Roth IRA that I contribute to monthly for retirement. I’m absolutely thrilled with the growth my blog has seen in 2018! The fact that we were able to pay off debt because of my income is so darn exciting. What’s even more amazing is that there is no limit to my earning potential. I made less per year working in an office, and my income was never going to grow all that much with that job. My 2018 blog income may seem modest to some, but it’s limitless! It almost quadrupled from 2017 to 2018, and while I don’t foresee that happening again to the same extent, I love knowing that the sky is the limit. As I learn to think and dream bigger, I know I’ll be able to reach more people and achieve bigger goals! If you want to start a blog, do it! It is one of the most inexpensive businesses to start and I honestly think that anyone interested should try it! I recommend starting with hosting from BigScoots. Their “shared managed web hosting” plans are very inexpensive and are enough to get you started. Immediately take the WordPress for Beginners course from Udemy. It will help you get your site set up and help you get comfortable with the basics, which can be super overwhelming if you don’t have help. This is the course I took when I started my blog and it saved me a ton of frustration! From there, just start writing and learn as you go! I hope this blog income report has been an encouragement to you! Feel free to ask any question in the comments. Hi Christine! This is so incredible! We love hearing real stories like this from our publishers. Thank you so much for sharing your Mediavine earnings in your income report and congratulations on your amazing growth! Here’s to an amazing 2019 ahead! Thank you Susannah! LOVE Mediavine! Congratulations on your blog! It looks great!! ❤️ I’m glad you enjoyed my report. Just keep working at it — we all start at zero and then get to watch it grow! Hi! I was so impressed by real stories of bloggers like you. I’m Iya, 24 yrs old and from the Philippines. I’m very interested starting my own blog but I don’t know how to start. I really don’t know the process here in the PH. Can yoi give me some advice on how can I start my own blog? I am curious what blog course cost $1,500. It wasn’t exactly a blogging course. It was more about creating and marketing courses online, called Digital Course Academy by Amy Porterfield. It definitely was a big purchase, but it lined up perfectly with my goals for the year.